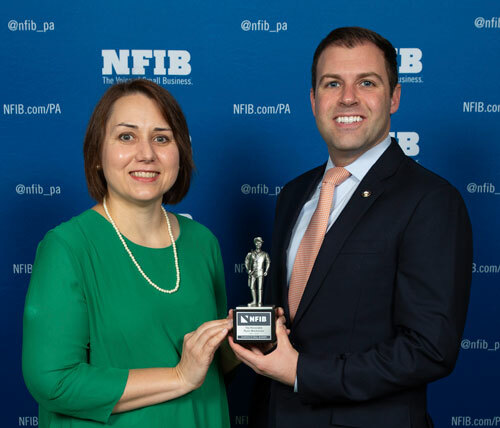 HARRISBURG – This week, Rep. Ryan Mackenzie (R-Lehigh/Berks) was presented with a Guardian of Small Business Award from the National Federation of Independent Business (NFIB) in Pennsylvania for his strong support of small businesses in the Commonwealth. Mackenzie, a member of the House Labor and Industry Committee, was one of only 25 members of the Pennsylvania House of Representatives to be recognized with the designation for having a 100 percent pro-small business voting record. A 100 percent score indicates a state lawmaker supported small businesses in Pennsylvania each time an important vote was taken during the 2017-2018 legislative session when it impacted small and independently owned companies. Rep. Ryan Mackenzie was presented with a Guardian of Small Business Award from the National Federation of Independent Business (NFIB) for his strong support of small businesses in the Commonwealth. Presenting him the award is Rebecca Oyler, legislative director of NFIB-Pennsylvania.